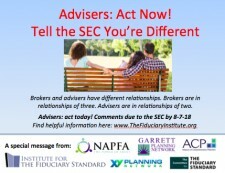 WASHINGTON, June 28, 2018	(Newswire.com) - ​Several nationally recognized groups of fiduciary advisers today announced an initiative to urge RIAs (SEC and state registered investment advisers) to write the SEC (Securities Exchange Commission) and explain how independent financial advisers are different from brokers. The initiative launches as the SEC seeks comments on proposed rules related to standards for FINRA licensed brokers and SEC / state registered investment advisers. Comments are due Aug. 7 and should be emailed to rule-comments@sec.gov (Subject line: S7-08-18). ​The Institute for the Fiduciary Standard has created a page where interested advisers can download ready-to-use flyers and social media graphics: www.thefiduciaryinstitute.org. “Registered investment advisers – also known ‘in short’ as RIAs – can point out these differences, noted by the courts, in basic human terms. In a broker relationship there are three entities involved – the company that is manufacturing and/or selling the investment or insurance products, the customer purchasing the products, and the broker in the middle who earns a commission for products sold. On the other hand, in an adviser relationship there are just two entities: the client and the adviser. The adviser and the broker treat retail investors in entirely different ways,” Rostad said. The proposed rules depict broker and adviser conduct as essentially the same, like identical twins. This depiction is confusing and wrong. The legal, contractual, business and cultural differences dividing brokers and advisers are important, and must be clearly stated and explained. “XY Planning Network seeks to bring real financial planning advice to Gen X and Gen Y because we believe consumers should have a choice between a salesperson who provides only incidental advice and a financial planner who provides real financial advice,” said Michael Kitces, CFP®, co-founder of the XY Planning Network, the nation’s leading organization of fee-only financial advisers focused on working with clients on a monthly subscription basis. Comments to the SEC are due August 7, 2018. Fiduciary financial advisers should email their comments to rule-comments@sec.gov. The “Raise Your Voice” group suggests fiduciary advisers pay special attention to S7-08-18. Subject line should read: S7-08-18. The Institute for the Fiduciary Standard formed in 2011 as a non-profit to provide research and education on the vital role of the fiduciary duties for investors and the capital markets. The Institute’s Best Practice advisers affirm their fiduciary and fee-only practices to the SEC. See www.thefiduciaryinstitute.org. Alliance of Comprehensive Planners (ACP), formerly Alliance of Cambridge Advisors (ACA), is a community of tax-focused financial planners who provide comprehensive planning strategies for their clients on a fee-only retainer basis. ACP members are required to maintain the CFP® or CPA/PFS (or equivalent) designation, complete ACP’s rigorous training program, and meet some of the highest continuing education requirements in the industry. To learn more visit www.ACPlanners.org.